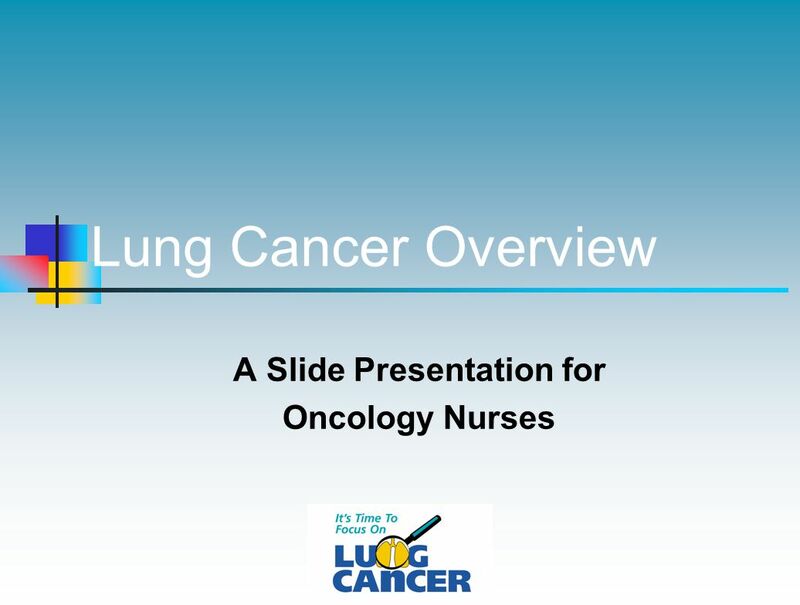 Lung Cancer Overview A Slide Presentation for Oncology Nurses Lung cancer is a common, yet challenging type of cancer to screen and manage. 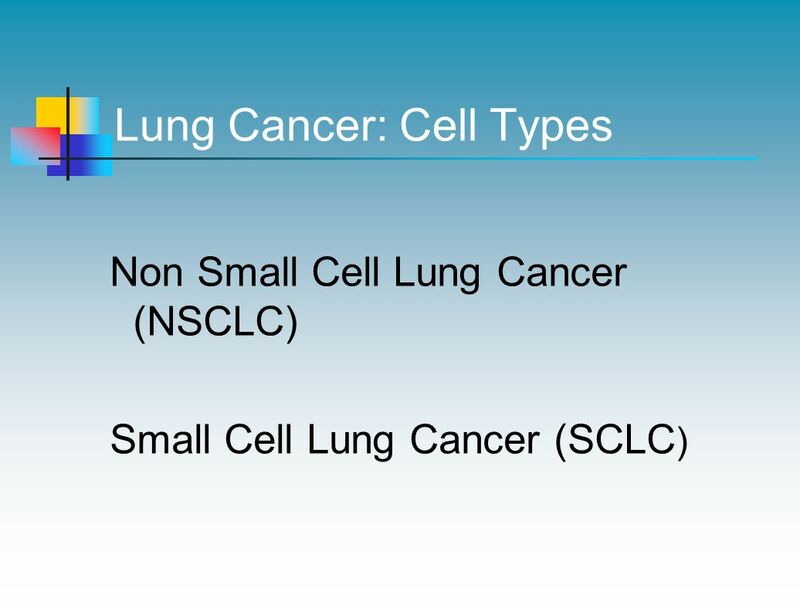 This program focuses on the basic epidemiology, screening tools, and treatment methods of both non-small cell and small cell lung cancer. 173,770 new cases yearly (2004 statistics) 160,440 deaths yearly (2004 statistics) More deaths from lung cancer than prostate, breast and colorectal cancers combined Closely correlated with smoking patterns Decreasing incidence and deaths in men; continued increase in women Incidence and mortality rates higher for African Americans than white Americans It is estimated that approximately 173,770 new cases of lung cancer will be diagnosed in the United States in It is also estimated that 160,440 persons will die as a result of lung cancer in 2004, which makes it the leading cause of cancer deaths. 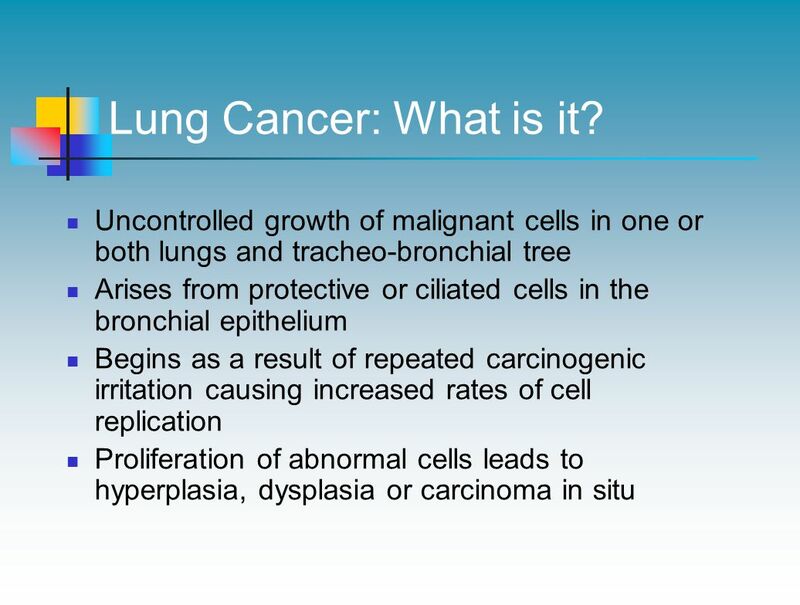 In fact, each year more persons die of lung cancer than of prostate, breast, and colorectal cancer combined. 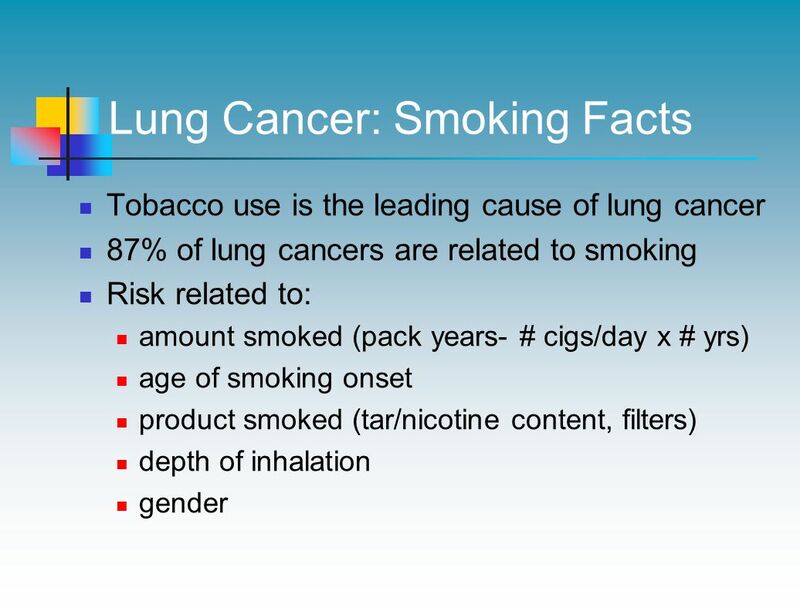 The incidence and mortality rate of lung cancer in men and women are closely correlated with tobacco use. In men, the incidence and mortality rates have been decreasing since the mid-1980s. From 1990 to 1998, the mortality rate decreased an average of 2.1% per year. In women, however, the incidence and mortality rate have increased steadily since the 1960s. Fortunately, the increase in the mortality rate in women has begun to slow over the last few years. 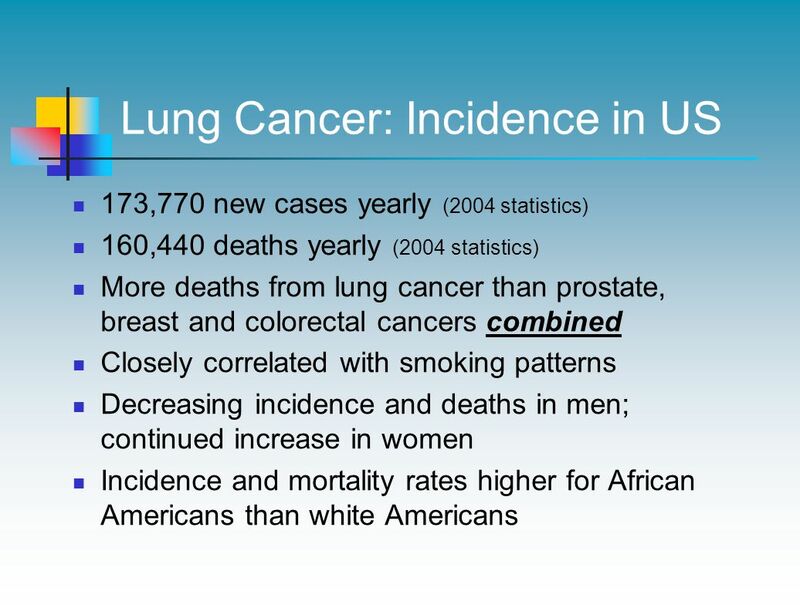 African-Americans, particularly men, are more likely to develop and die of lung cancer than white Americans. In fact, the incidence and mortality rate in African-American men is 40% greater than white American men. In women, the incidence and mortality rate are similar. Jemal A, Thomas A, Murray T, Thun M. Cancer statistics, CA Cancer J Clin. 2002;52:23-47. American Cancer Society Facts & Figures 2003, Atlanta, Ga., 2003. Account for 12 percent of all new cases Deaths increased 150% between 1974 and 1994 (68,510 in 2004) More deaths from lung cancer than breast, ovarian and uterine cancers combined Women are more susceptible to tobacco effects times more likely to develop lung cancer than men with same smoking habits It is expected that a diagnosis of lung cancer will be made in approximately 80,660 women in the United States in This means that lung cancer is expected to account for 1 out of 8 new cases of cancer in women, an incidence comparable to colorectal cancer. Only breast cancer is more common accounting for about 1 out of 3 new cases of cancer in women. 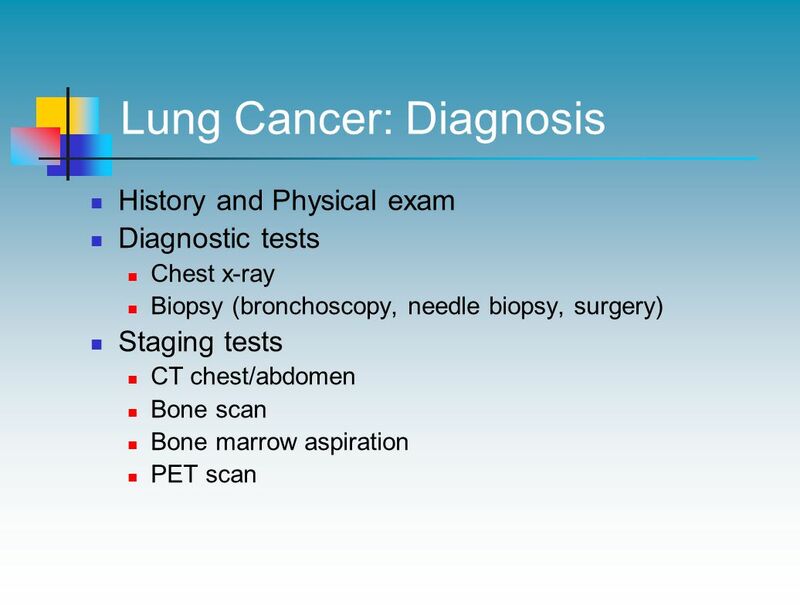 The mortality rate in women with lung cancer has increased 50% since 1980 accounting for an estimated 68,510 deaths in The mortality rate for lung cancer in women is slightly greater than the mortality rates for breast, ovarian, and uterine cancers combined. 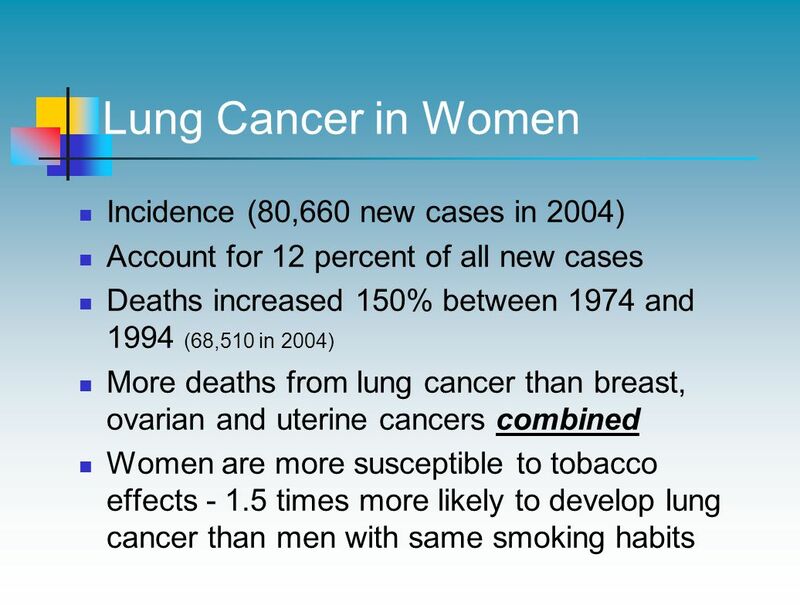 In women age 60 years and above, lung cancer is the leading cause of cancer death. This probably stems from the fact that the incidence of smoking in women began to increase around World War II. Jemal A, Thomas A, Murray T, Thun M. Cancer statistics, CA Cancer J Clin. 2002;52:23-47. American Cancer Society Facts & Figures 2004, Atlanta, Ga., 2004. 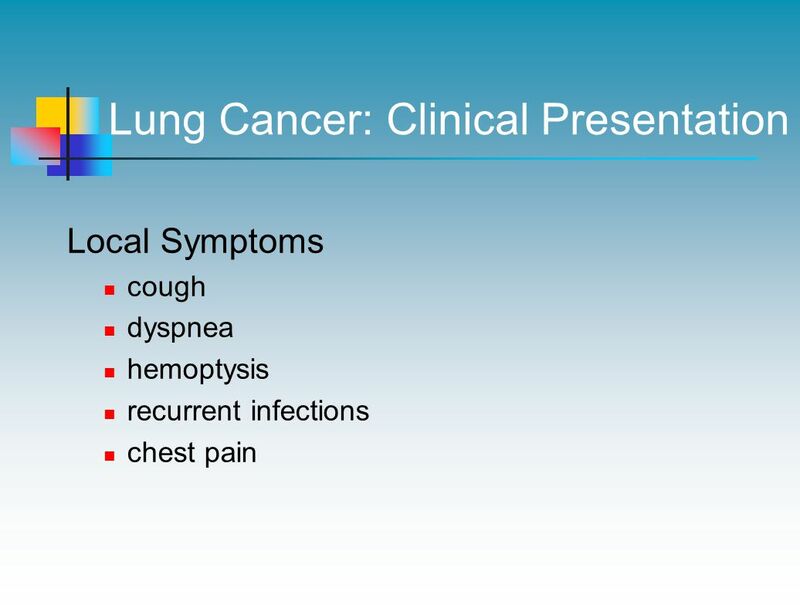 5 Lung Cancer: What Causes It? 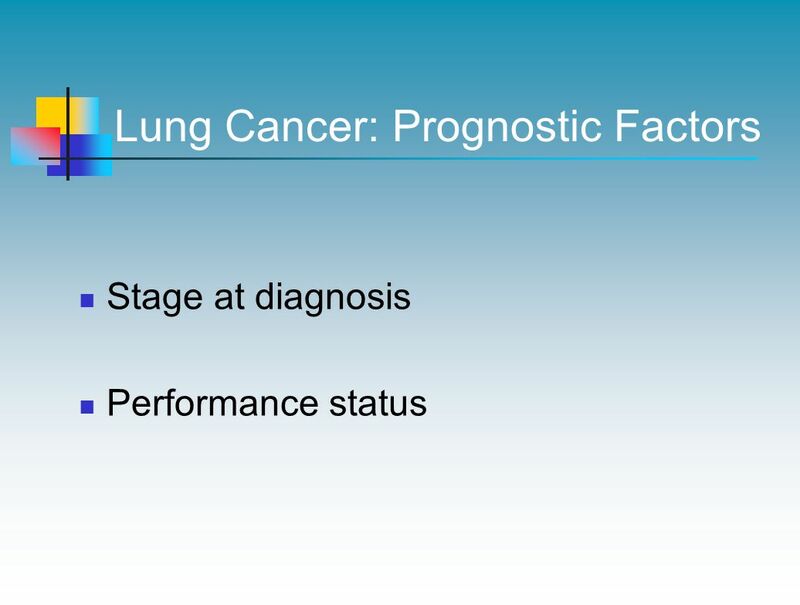 Stage at diagnosis Performance status Numerous factors have been evaluated to determine their prognostic utility for lung cancer. These include the presence or absence of molecular genetic markers, growth factors and receptors, and pathologic features such as angiogenesis and cell proliferation. None has been shown to be as useful as the stage of the disease, which remains the prognostic benchmark. Stage is also useful for treatment planning as well as a means of communicating among healthcare professionals and patients. Another highly consistent prognostic factor is the patient’s performance status. 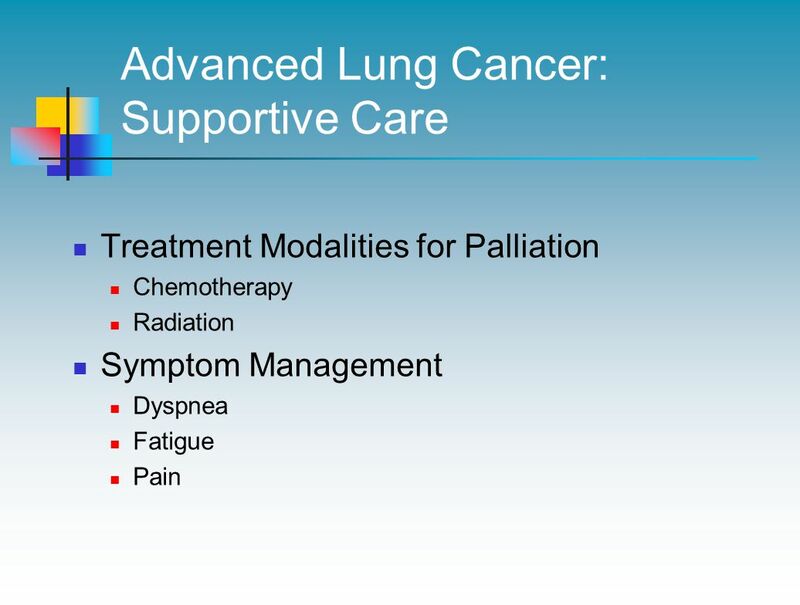 Several validated methods are available including Karnofsky, Zubrod, and the Eastern Cooperative Oncology Group scales. Weight loss and gender (females fare better than males) are also useful prognostic factors. Age does not appear to be an independent prognostic factor. Mountain CF. 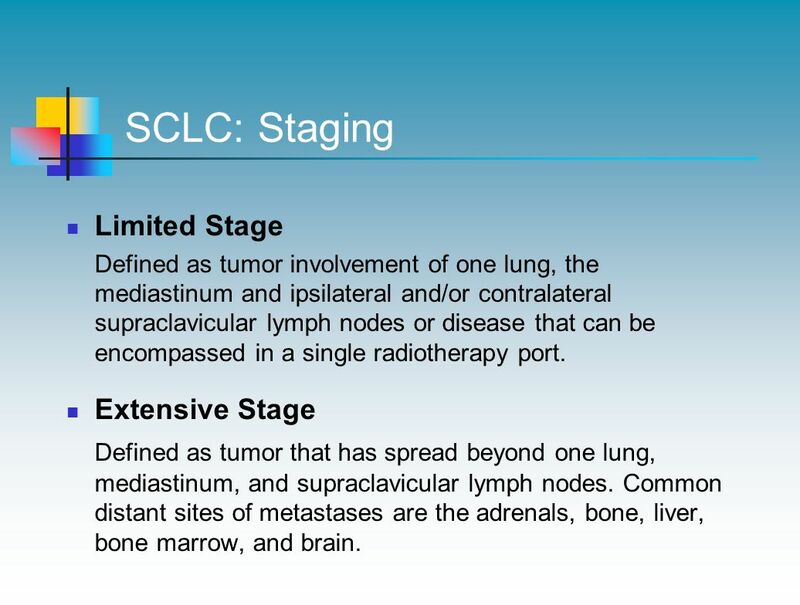 The International System for Staging Lung Cancer. Semin Surg Oncol. 2000;18: Feld R, Ginsberg RJ, Payne DG, Shepherd FA. Lung. In: Abeloff MD, Armitage JO, Lichter AS, Niederhuber JE, eds. 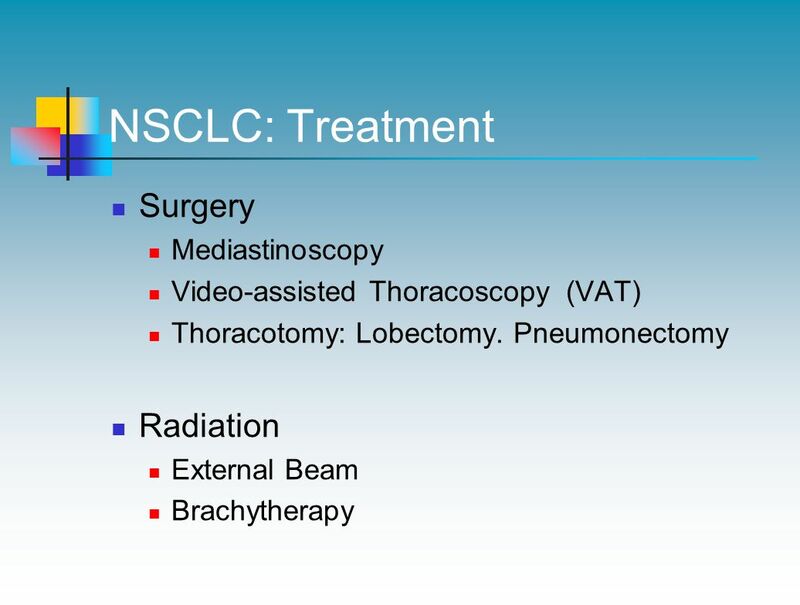 Clinical Oncology. 2nd ed. New York, NY: Churchill Livingstone; 2000: Bunn PA Jr., Mault J, Kelly K. Adjuvant and neoadjuvant chemotherapy for non-small cell lung cancer. Chest. 2000;117:119S-122S. 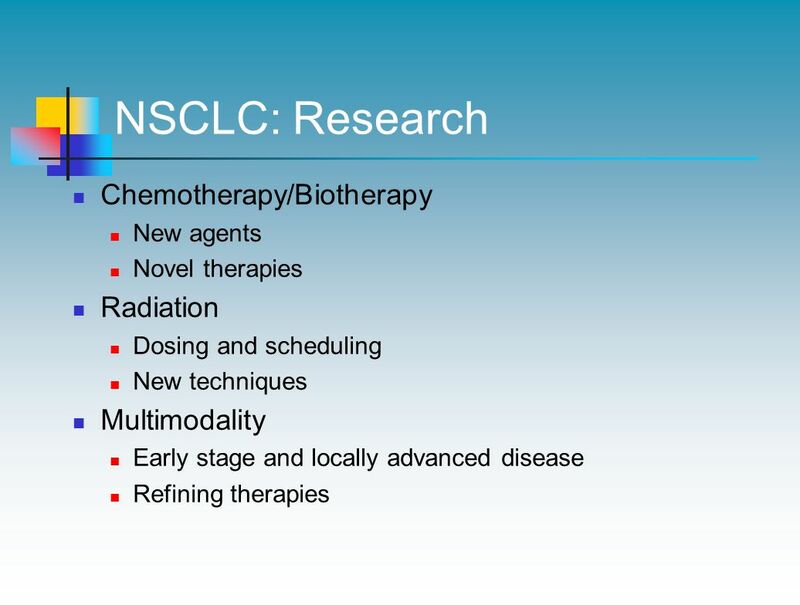 New agents Novel therapies Radiation Dosing and scheduling New techniques Multimodality Early stage and locally advanced disease Refining therapies Research efforts to improve the outcomes of patients with non-small cell lung cancer are on-going. The addition of the taxanes paclitaxel and docetaxel, the antimetabolite gemcitabine, the topoisomerase I inhibitor irinotecan, and the vinca alkaloid vinorelbine have led to improved survival. Agents such as tegafur and uracil (UFT), oxaliplatin, and amifostine, as well as new combinations of chemotherapy agents are being studied. Investigational agents include tirapazamine and multitargeted antifolate. Other agents, including immune stimulators and vaccines have also been studied mostly with disappointing results. 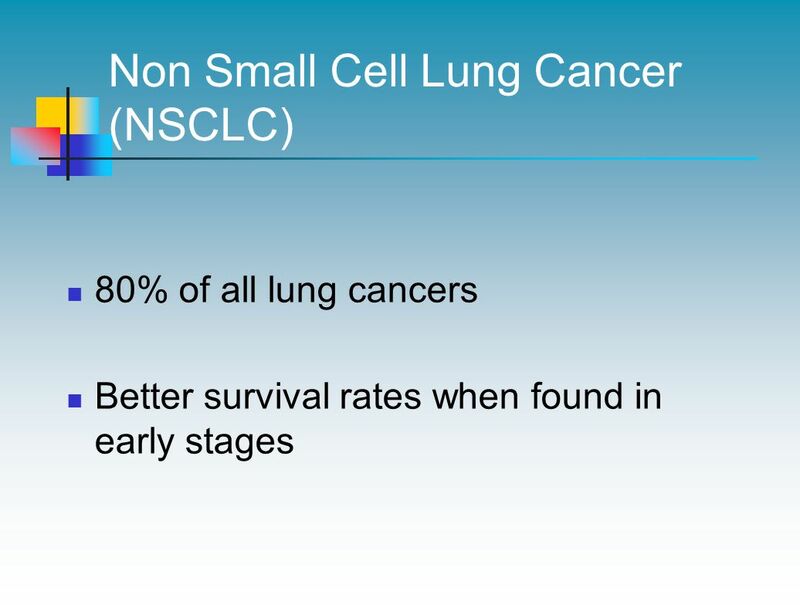 Bacille Calmette-Guérin (BCG) administered into the pleural cavity in stage I non-small cell lung cancer has shown no benefit and, in fact, may actually decrease the disease-free interval. 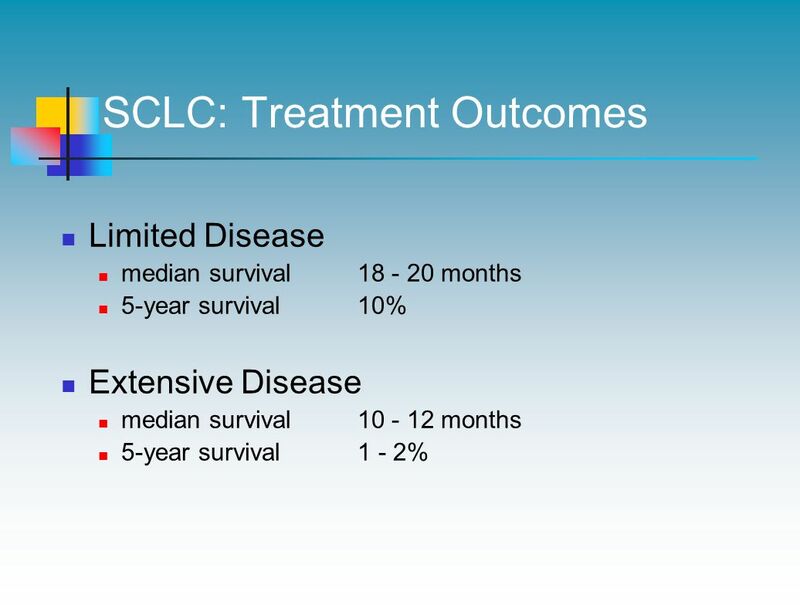 Levamisole has been studied with no demonstrable benefit in epithelial lung cancer and in combination with BCG as adjuvant therapy for stage II and III adenocarcinoma and large cell carcinoma. Trials of interferon-, -, - alone or in combination with chemotherapy have not shown any benefit. Similarly, interleukins have failed to provide significant effects. Agents that act on the known as well as postulated biologic mechanisms of cancer are under investigation. 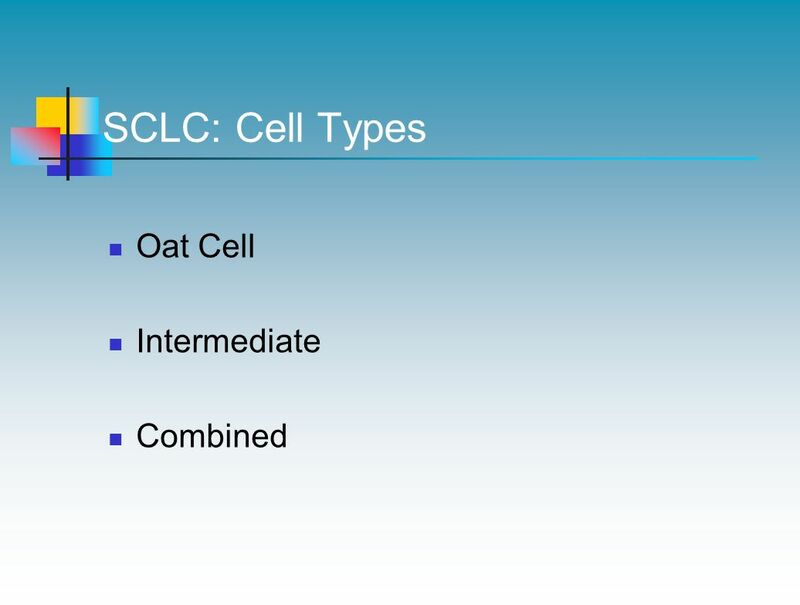 Such agents include monoclonal antibodies and matrix metalloproteinase inhibitors, as well as those that affect gene transfer and alteration, peptide growth factors, epidermal growth factors, nerve growth factor, and insulin-like growth factor 1. The role of radiotherapy continues to evolve as more data and new techniques become available. Various doses and schedules are being studied alone or in combination with other therapies. Altered fractionation radiotherapy, that is radiotherapy other than the standard 1.8 to 2 Gy delivered once daily, 5 times per week for 6 to 7 weeks, is being evaluated. Alterations include hyperfractionation, hypofractionation, accelerated radiotherapy, and continuous hyperfractionation accelerated radiotherapy (CHART). 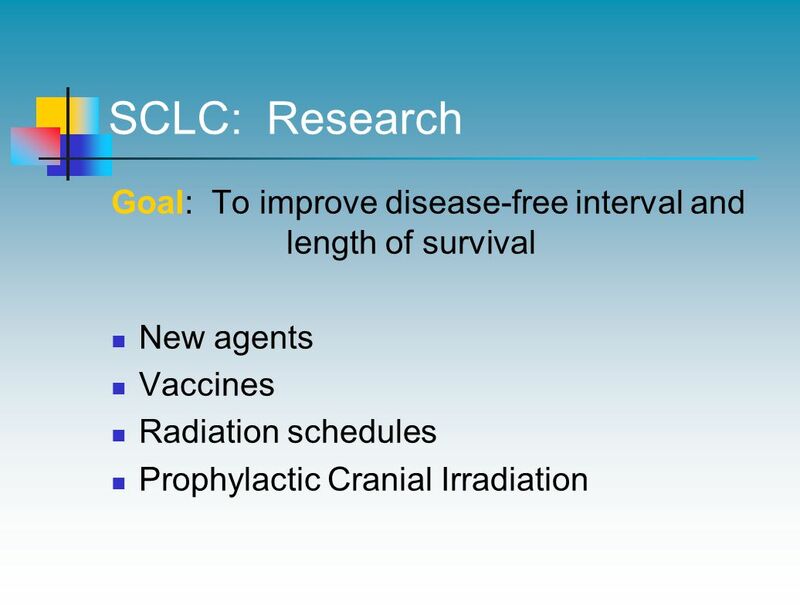 The basic goal of altered fractionation radiotherapy is to deliver a higher total dose of radiation to improve the local outcome without increasing late normal tissue toxicity. Such schemes exploit the significant differences in the capacity of late-responding and early-responding tissues to repair radiation cellular damage. Other evolving radiotherapies include the combined use of different radiotherapy techniques, three-dimensional conformal radiotherapy, and the use of radio sensitizers and radio protectors. Also under investigation is the use of multimodality therapy using sequential chemotherapy and radiotherapy. 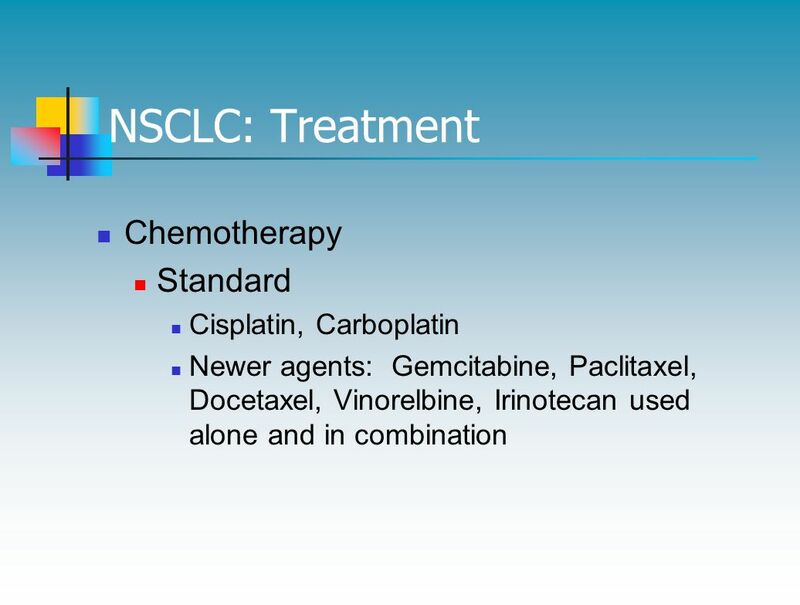 The use of induction or neoadjuvant chemotherapy is based on the suggestion that early use of chemotherapy may lower the systemic tumor burden and prevent the growth of microscopic systemic disease. 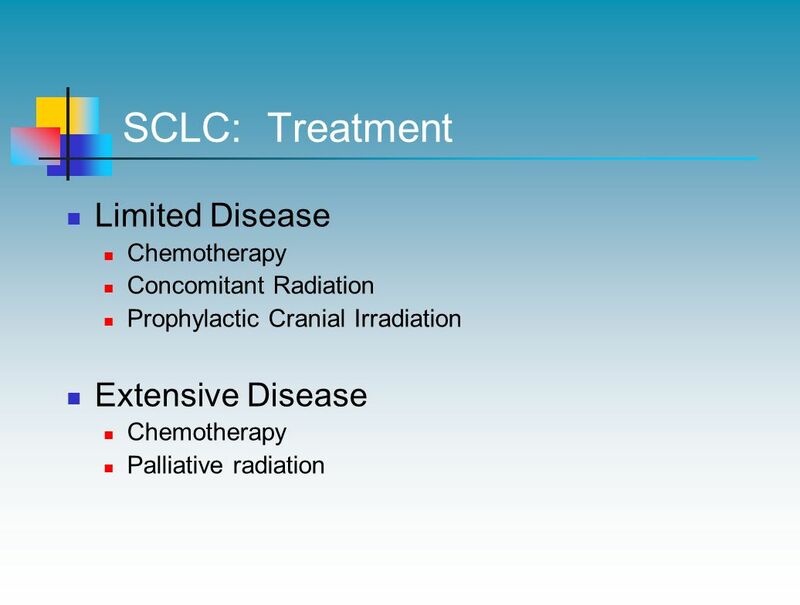 At the same time, bulky locoregional macroscopic disease is decreased and treated more effectively by subsequent surgery, radiotherapy, or both. 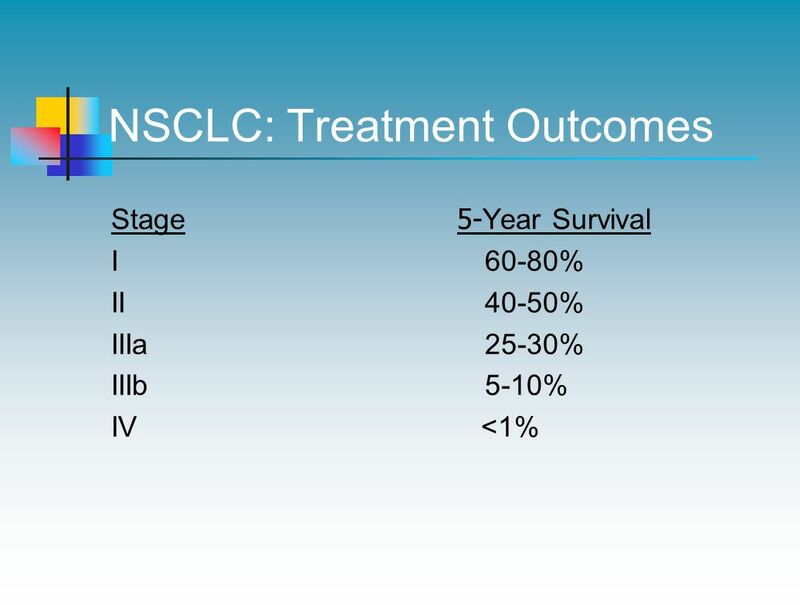 Ginsberg RJ, Vokes EE, Rosenzweig K. Non-small cell lung cancer. In: DeVita VT Jr , Hellman S, Rosenberg SA, eds. Cancer Principles and Practice of Oncology. 6th ed. 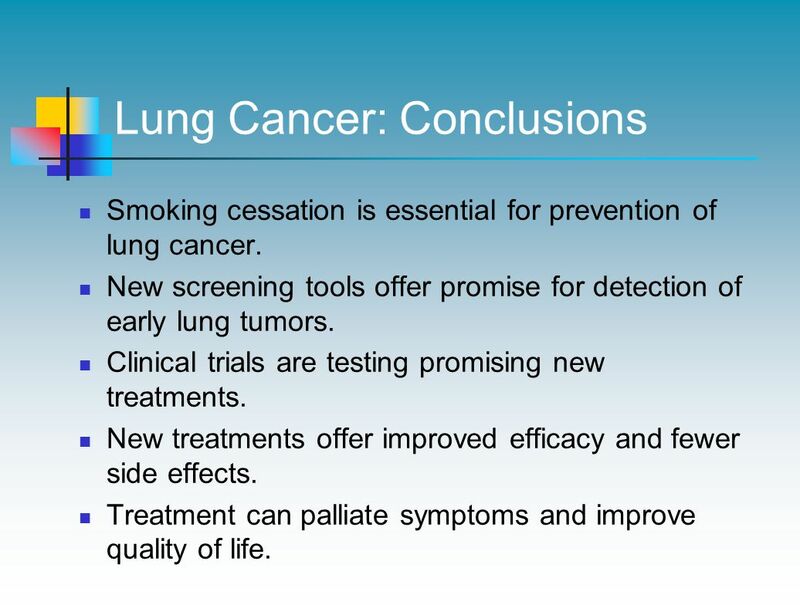 Philadelphia, Pa: Lippincott-Raven; 2001: Bunn PA Jr., Kelly K. New combinations in the treatment of lung cancer. A time for optimism. Chest. 2000;117:138S-143S. Bunn PA Jr., Soriano A, Johnson G, Heasley L. New therapeutic strategies for lung cancer. Biology and molecular biology come of age. Chest. 2000;117:163S-168S. 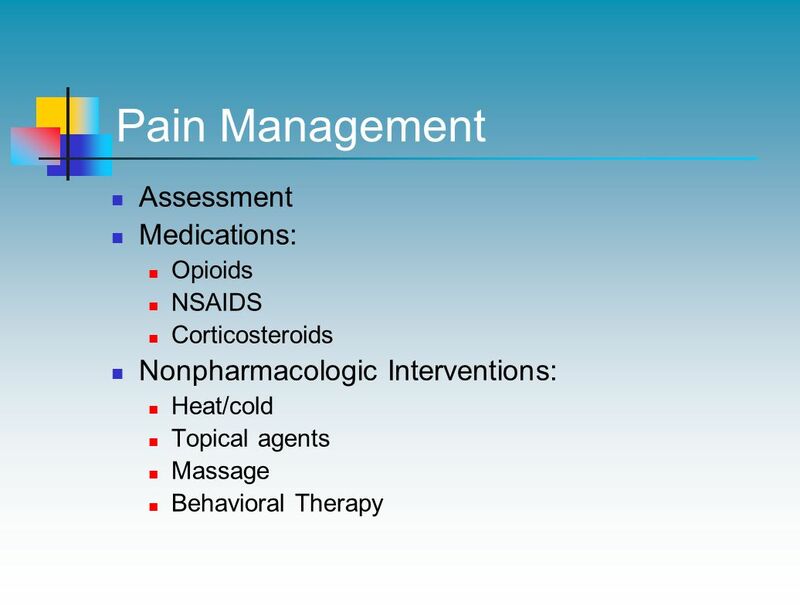 Opioids NSAIDS Corticosteroids Nonpharmacologic Interventions: Heat/cold Topical agents Massage Behavioral Therapy Pain is a common, yet generally undertreated, complication of cancer. Identifying the etiology of pain is essential to its effective management. 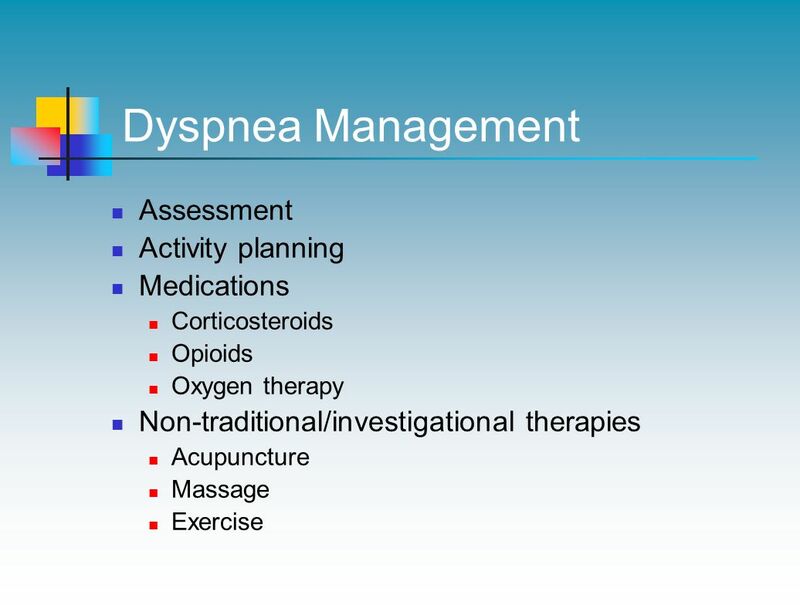 The goals of the initial assessment, much the same as they are for dyspnea and fatigue, are to characterize the pathophysiology of the pain, to determine the intensity of the pain, and to determine its impact on the patient’s ability to function. Factors that may influence analgesic response or result in persistent pain should be assessed and managed, if possible. A three-step framework for pain management based on pain severity has been established by the World Health Organization. For mild pain, acetaminophen or a non-steroidal anti-inflammatory agent may be used initially. If pain relief is unsatisfactory, a more potent analgesic may be used. Most patients with cancer who have pain do not achieve an adequate response with this initial therapy and must be managed with an opioid. Opioids are the mainstay for management of most moderate to severe pain in patients with cancer. Unfortunately, the use of opioids is often avoided or they are used ineffectively since their long-term use is widely believed to lead to addiction. This is an incorrect belief. While long-term use is likely to cause tolerance and physical dependence, psychological dependence, i.e., addiction, is uncommon. Similarly, respiratory depression is often a concern, although this too is unlikely since the opioid dose is generally titrated over a long period. Morphine is most commonly used, but other opioids such as oxycodone, hydromorphone, and fentanyl are also effective. The key to the management of pain is to prevent it rather than to treat it once it has occurred, a clinical practice similar to nausea and vomiting. Thus, the administration of an opioid on a fixed schedule in fully effective doses is required. Supplemental doses may be administered as needed for break-through pain. Numerous adjuvant analgesics have been used for the wide variety of pain syndromes seen in patients with cancer. These include antidepressants, anticonvulsants, local anesthetics, corticosteroids, bisphosphonates, and others. Corticosteroids have gained wide acceptance for the management of cancer pain of bone, visceral, and neuropathic origin. Non-pharmacologic interventions may also be helpful, particularly for musculoskeletal pain. These include heat, cold, and massage. The use of heat on recently irradiated tissue is contraindicated, however, and cold should not be applied to patients with peripheral vascular disease or on tissue damaged by radiotherapy. Massage has direct mechanical effects on tissues and enhances relaxation when applied gently. Tumor masses should not be aggressively manipulated. Behavioral therapy is an important part of a multimodal approach to pain management since it gives the patient a sense of control and helps to develop coping skills. Such interventions should be introduced early in the course of the illness as they are more likely to be learned and practiced by patients while they have sufficient strength and energy. National Cancer Institute. Pain (PDQ®) Health Professional Version. Available at: Accessed September 12, 2002. Smoking cessation is essential for prevention of lung cancer. 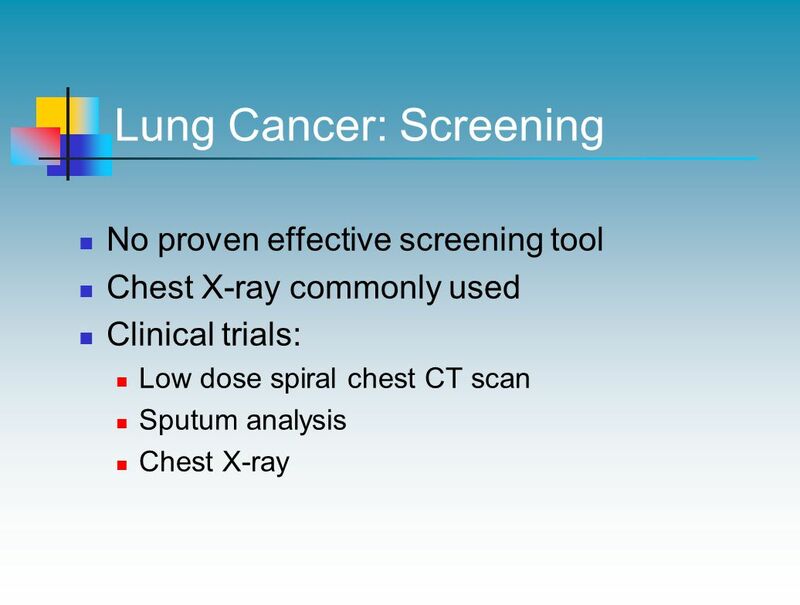 New screening tools offer promise for detection of early lung tumors. Clinical trials are testing promising new treatments. New treatments offer improved efficacy and fewer side effects. 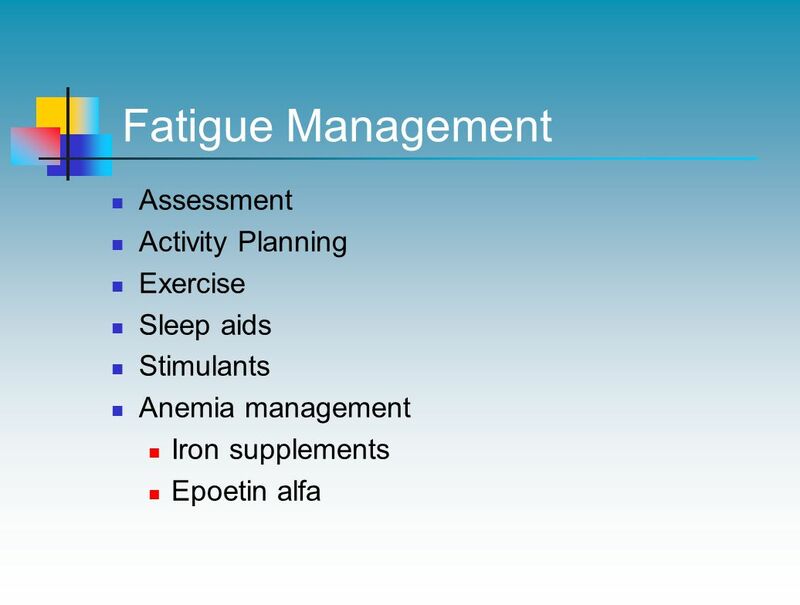 Treatment can palliate symptoms and improve quality of life. 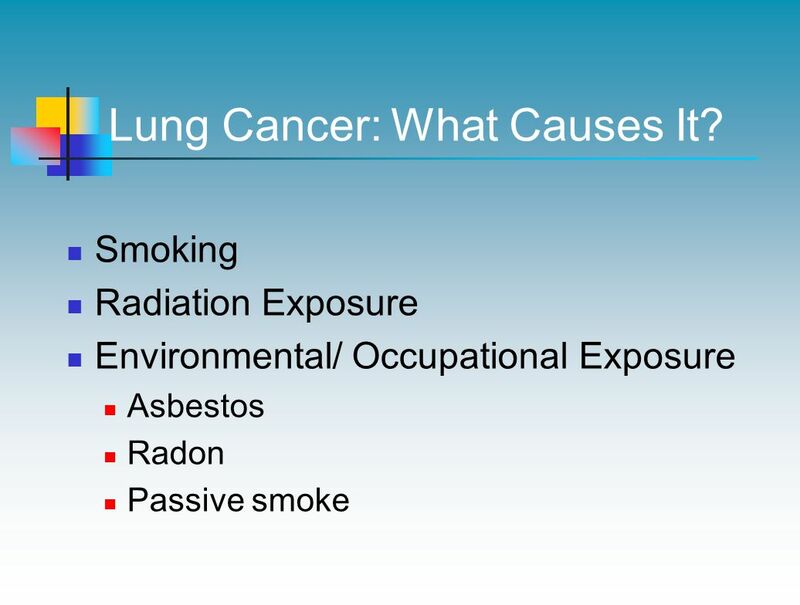 In summary, since tobacco is a causative factor in at least 80% of patients with lung cancer, smoking cessation and its avoidance are essential for preventing or reducing the risk of lung cancer. New screening tools, such as low-dose spiral CT, offer some promise for the detection of early lung tumors. Further study is needed to clarify their roles in routine clinical practice. Although progress in improving patient outcomes has been slow, particularly for small cell lung cancer, a variety of new treatments are being actively investigated. 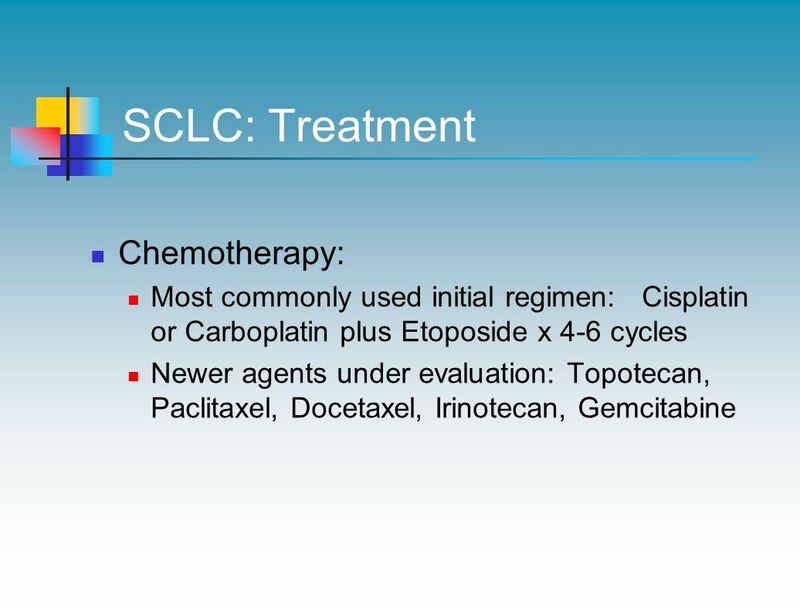 These include new chemotherapy agents as well as agents that alter the biologic response to tumor development and growth. While improving efficacy is a clear goal for these new therapies, so, too, is decreased toxicity. Last, while generally intended to improve survival, treatment is often used to palliate symptoms and improve the quality of life. 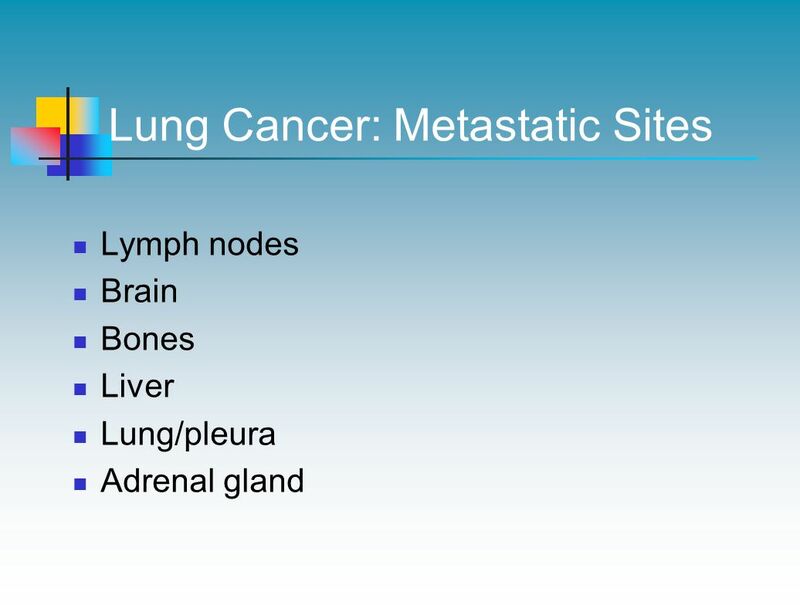 Download ppt "A Slide Presentation for Oncology Nurses"
Upper Gastro-Intestinal Malignancies Dr Paddy Niblock Consultant Clinical Oncologist 13 th October 2010. 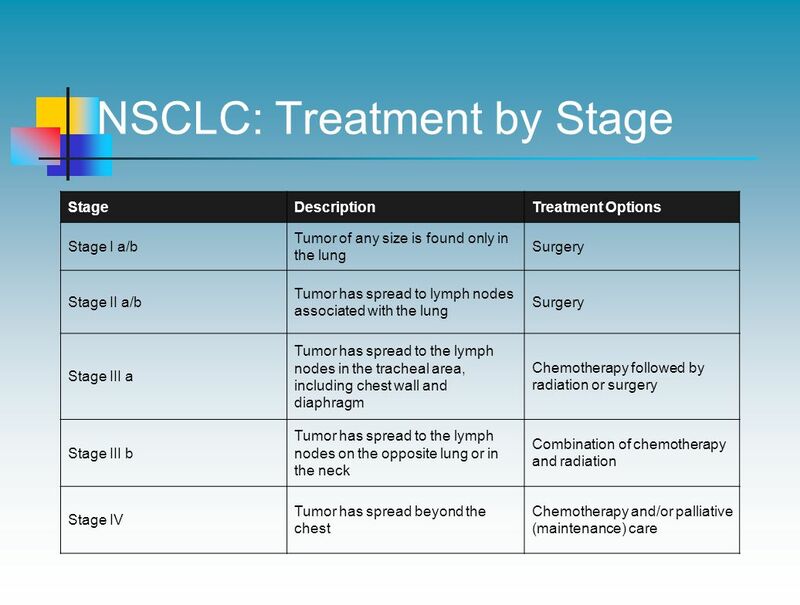 STAGING OF BRONCHOGENIC CA NSCLC STAGING TNM CLASSFICATION Adenocarcinoma Squamous cell carcinoma Large cell carcinoma T – Primary tumor N – Regional. Ca lung Dr. D.P. Singh Professor, Surgery.. Primary lung cancer – risk factors Cigarette smoking Number of years Number of packs Passive smoking Atmospheric. 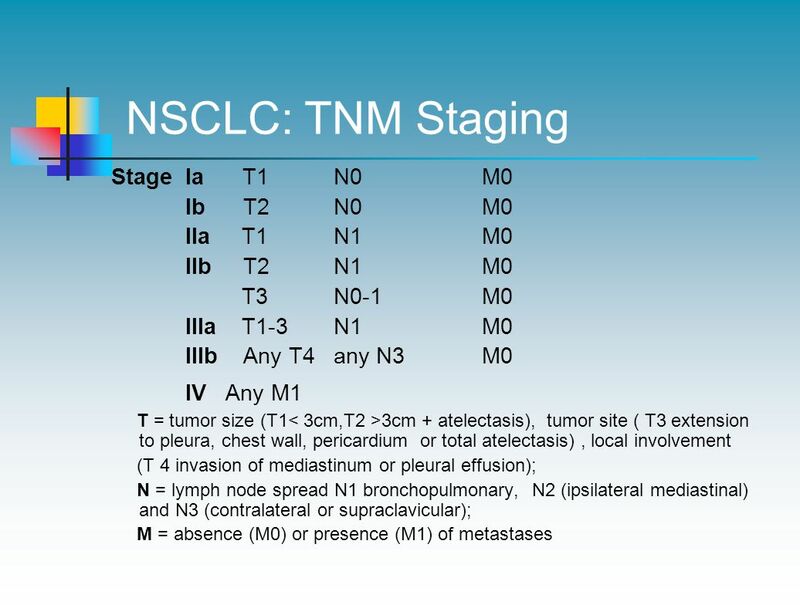 TNM staging and prognosis Alexandru Eniu, MD, PhD Medical Oncologist Department of Breast Tumors Cancer Institute Ion Chiricuţă Cluj-Napoca, Romania. Klara Matijević Mentor: A. Žmegač Horvat. 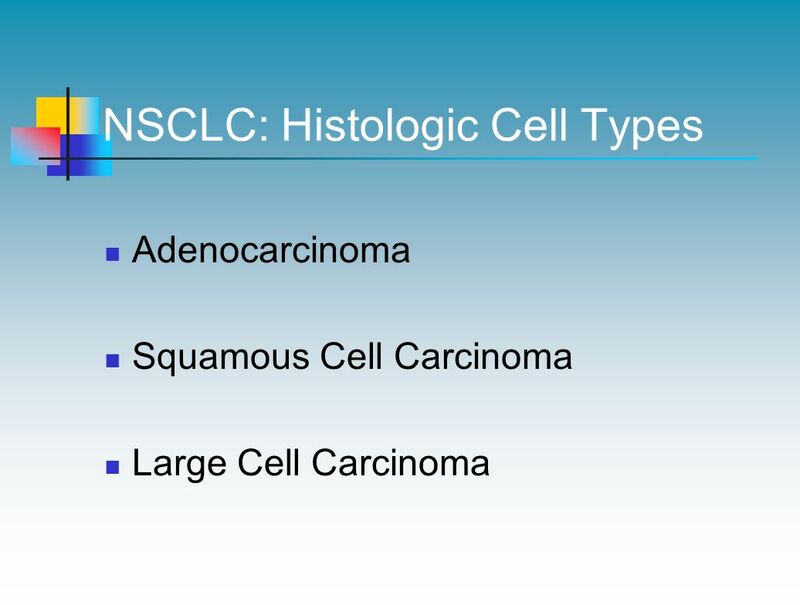  adenocarcinoma  gastrointestinal stromal tumours (GIST)  primary gastric lymphoma  gastric polyps. 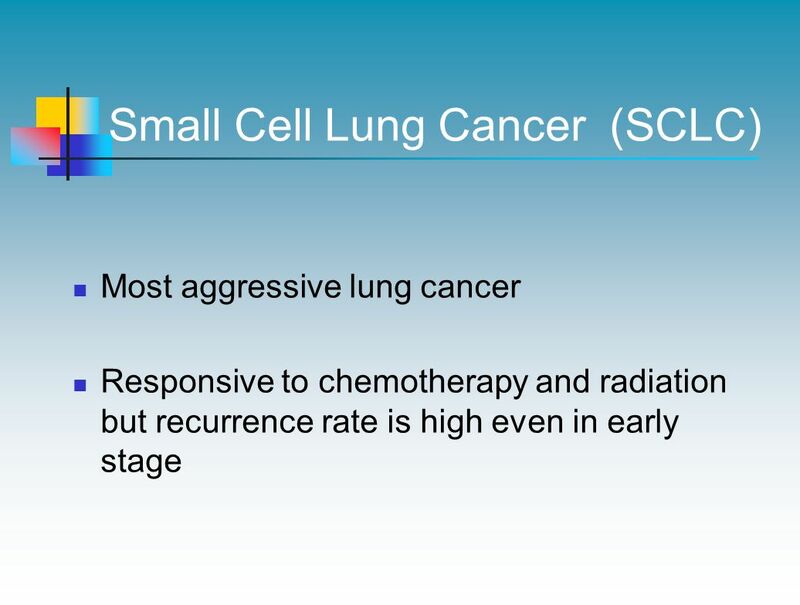 Lung Cancer Non-Small Cell Staging/Prognosis/Treatment Oncology Teaching October 14, 2005 Lorenzo E Ferri. Lung Cancer for Finals SypRFSignsCompInxHistologyRxSurg Simple Success Tim Robbins Academic FY1 UHCW. L UNG T UMORS. 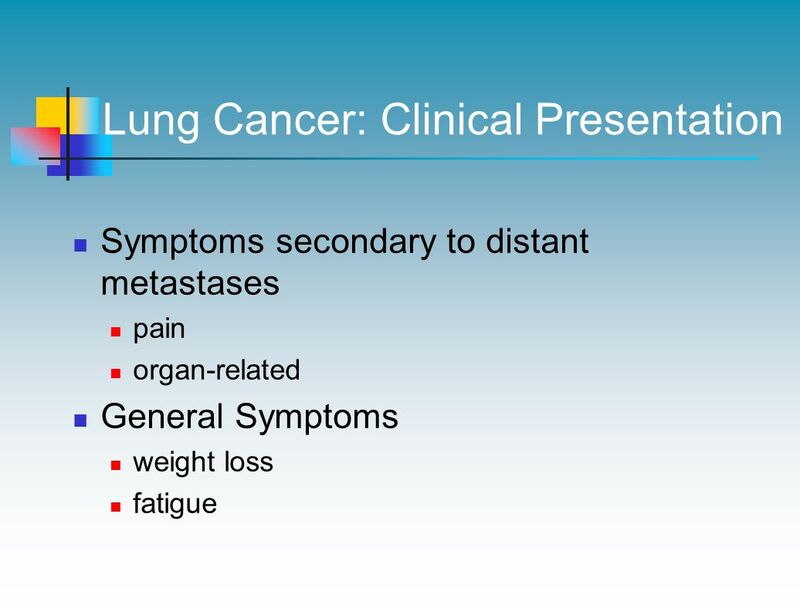 Lung cancer is the leading cause of cancer deaths in both women and men about 2% of those diagnosed with lung cancer that has spread to. Rowa’ al Ramahi 1. 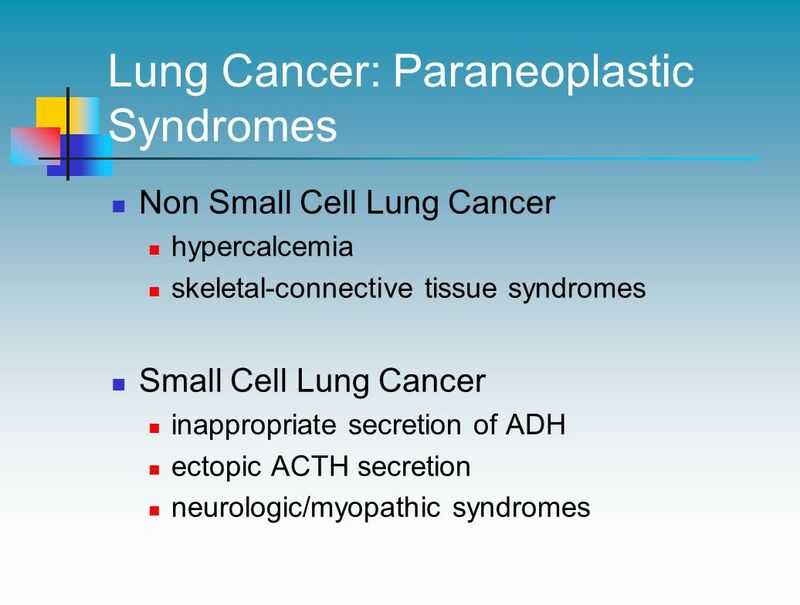  Lung carcinomas arise from normal bronchial epithelial cells that have acquired multiple genetic lesions and are capable of expressing. 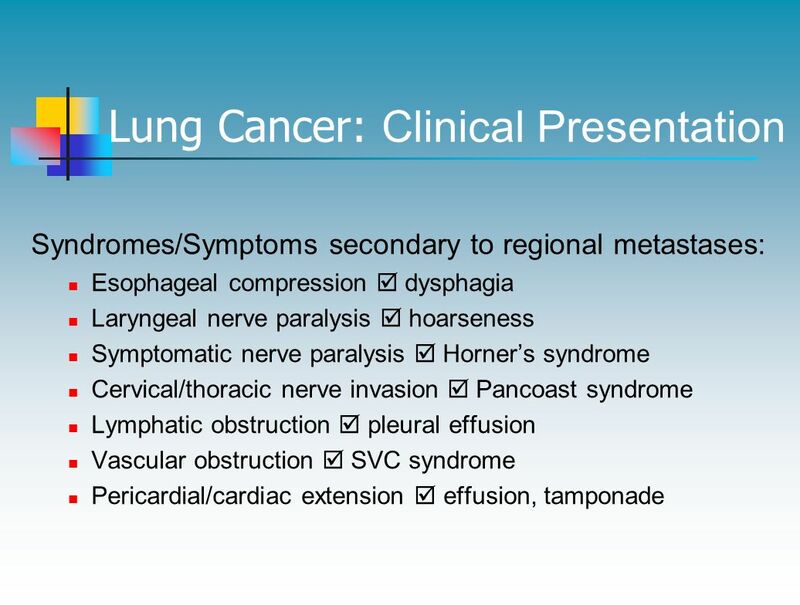 LUNG CANCER..... NIMI-HART PHILIP PREMED DEFINITION EPIDEMIOLOGY TYPES CAUSES SIGNS AND SYMPTOMS STAGING DIAGNOSIS TREATMENT PROGNOSIS PREVENTION. Matthew Kilmurry, M.D. St. Mary’s General Hospital Grand River Hospital.